More than 100 Canadian-Arab Christians are listed on an Al Qaeda affiliated website, apparently targeted because of their alleged role in attempting to convert Muslims. Some of those named say concerned Canadian intelligence officials have contacted them. 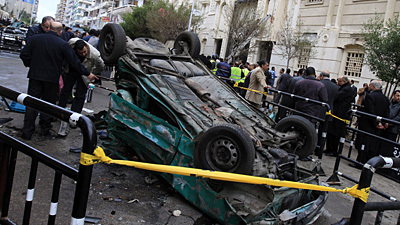 Officials inspect the site of the bomb attack in Alexandria. At least 21 people have been killed in Egypt by a suspected suicide bomber who targeted Christians as they emerged from a church following a service to mark the New Year. Police initially said the blast was caused by a car packed with explosives which was parked outside the Saints Church in the northern city of Alexandria. The interior ministry later said the explosion was more likely to be by a suicide bomber on foot and there were indications of “foreign elements”. Following the atrocity, the Pope demanded protection for Christians as he urged world leaders to defend them against abuse and intolerance. The governor of Alexandria, Adel Labib, accused al Qaeda of planning the bombing, state television reported. If the terror network had a direct role, it could be a worrying development in Egypt, where the government has persistently denied the group has a significant presence on the ground. Following the October 31 massacre at Our Lady of Salvation church in Baghdad, the dwindling Christian community in Iraq decided to cancel public observances of the Christmas season, in the hope of avoiding further bloodshed at the hands of their Muslim neighbors. Although Muslims attacked churches in Nigeria and the Philippines, it seemed as is the Iraqis might have some respite from the horrors of Jihad. However, any such hopes were dashed Thursday night, as a series of attacks on Christian homes in Baghdad signaled that no sanctuary remains for the persecuted remnant in their native land. At least four Christian homes in Baghdad were hit Thursday night in the first string of attacks since al-Qaida-linked militants last week renewed their threats of violence against Christians in Iraq.